In a nutshell, I had a successful race in what was probably the hardest work I’ve ever done on a bike. I completed The Route of the Conquistadors three-day stage race in Costa Rica Oct 24-25-26 (2013). The Route of the Conquistadors race starts on the Pacific coast at Jaco and finishes on the Caribbean beach at Limon. I did wonder if I would have anything left after stage one (or two) for subsequent stages. I had done numerous big races before (100 milers, 12 or 24 hour events) but to do this 3 days in a row? It turned out I was tired, but not drained. I had energy at the end of each stage to ride 15-16 mph steady on flats and I was able to get going each subsequent day with plenty of energy. I think I have a strong endurance level developed. Three single serve Heeds, two single serve Perpetuems, three Chocolate Hammergels, Cliffbar, lots of Endurolytes. I used all of my Stage One allotment that day and ended up relying on checkpoint Gatorade and foods since the stage was so difficult. The next two stages weren’t as difficult and I didn’t use all the product I brought- but better safe than sorry. The days leading up to departure were anxious and I don’t think I slept well. Finalized all packing and got the bike dis-assembled Sunday in preparation for Monday’s flight. In my gear bag was three complete kits (jersey, bib, gloves, socks & hat. I also had base layer, windbreaker, arm & leg warmers (hey you never know)! I also set up three zip lock bags each which had 3 Hammerjel, three Heed single-serve, two single-serve Perpetuem and a Cliffbar. I had no intention of messing with bulk items. In the bike case, borrowed from Founders Racing teammate Jeff Jacobi, I also packed Hammer recovery bars and Soy Protein powder (single-serve). In the bike box, I also stowed my helmet and just the tools needed to re-assemble my bike. Flight from Grand Rapids was delayed but not relevant to me due to eight hour layover in Chicago. I had purchased ano Admirals Club membership (30-day trial) with this in mind and escaped the hubbub of the airport for the quiet and more relaxing club with free coffee and plenty of comfortable chairs as well as food or drinks to order. Flight to Miami delayed but we arrived on time at midnight. I spent a frustrating 45 minutes trying to connect and get to Embassy Suites for lodging. They didn’t want to answer late night phone calls and the shuttle apparently had to be notified. I ended up a short night sleep then back to the airport Monday for flight to Costa Rica. During the flight I spilled orange juice on my jeans and the seat. A flight attendant swapped the seat cushion for me and I changed into shorts for the remainder of the trip- appropriate given temperature in San Jose was 80 degrees. My biggest fear was the bike would get mis-routed by the airline so it was a HUGE relief to see Jacobi’s big grey box at baggage claim. A $40 cab ride to my already booked BnB (via AirBnB)- decent enough for the one night at $30. The race-recommended Best Western was $110. Got to my room (the Hotel Posada is a BnB with a tinge of hiker hostel feel) and began bike assembly. Everything traveled well except that the brake rotor on the rear wheel got a bit warped and rubbed in one spot due to pressure from the case and the orientation I needed to place it. I straightened to an acceptable state with pliers on hand. I may remove it for the trip home. I rode the bike up and down the street a bit to verify all was back to correct position. I took a walk into the core of San Jose and looking for restaurants, but on the way back to the hotel (perhaps six blocks) it really started to rain. I got to my room and changed to dry attire and flipped on the TV to kill time, expecting a let-up in rain. Nearly 2 hours later it was raining harder! So I borrowed an umbrella and went to a restaurant a couple doors down from the BnB which had been one of my choices. Back to the room to settle in for a 7am wake-up to get to the rally-point in the morning. All departures are from the Best Western where they will load our bikes to trucks and where we board buses for the drive to Jaco on the Pacific coast. Tuesday night I took stock of the lodging situation. Due to cost of taxi, logistics of equipment and mediocre dining opportunities as well as low proximity to anything, I cancelled my BnB reservation for the weekend after the race and booked into the Best Western. The race organizers will be dropping us off here Saturday night anyway. I also figured I’d be able to hang out with other racers before flying home rather than be isolated on the other side of town at the BnB. So Wednesday I took all gear including bike box to the Best Western Irazu, where they stowed it for the week. I met racers from all over the USA and a couple from the UK. There were several US women including one with her husband- both are riding (Josh Fonner and Christine Peligren). One guy from Rhode Island has done this race for 13 years. Another racer from North Dakota was here with his fat bike. He did it last year for the first time and had some good advice. He said the course is well marked but people do get off course. He carried his phone (international capable I presume, like mine) and cash so in case he did get if course he had money to buy additional water or whatever. Good plan- I will copy it. Our bikes were loaded to a truck and we got on a tour bus for the two hour ride to Jaco on the Pacific. For some reason I thought this event had a thousand competitors or more. Turns out it has barely peaked 500 in all the years. This year there is only about 450. This was the hardest day I’ve ever had on a bike! 70 miles with 12000 feet of climbing. I completed the course in 10:03. There was some rugged hike-a-bike sections where we literaly were slogging up or down some severely eroded clay sections – completely un-ride-able. I never did see a crocodile. 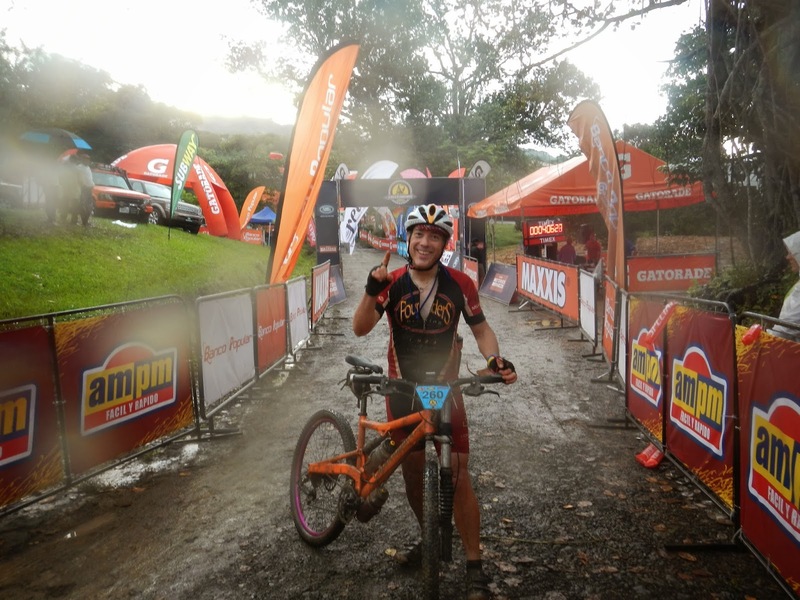 But one racer (Herman from Belgium) said he was in one river with other racers cleaning the mud from his bike when a local rider yelled “arriba arriba get out of the river” and a huge snake 7 feet long and about 8 inches in diameter went by! Someone else showed me a photo of a snake twice that size curled around a rock in the middle of the course. I don’t know if I didn’t see it as I went by or it moved by the time I went past. 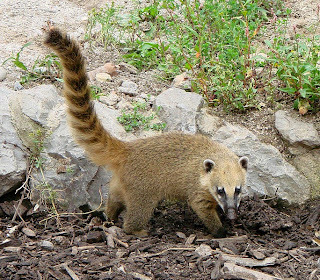 I did see one of the local mammals- a coatimundi (central American racoon). I finished ths stage and was really tired but surprisingly not completely depleted. The last descent after the highest peak of the stage was anxious. I could hear the thunderstorm and realized I was basically above the storm. I had to descend INTO the rain. I rode downhill pavement for 15-20 miles braking constantly and worrying about how slick the pavement was. (Turns out it was- I met another racer with road rash from that segment). I worried about my brakes. During the descents I could smell them heating up. I had brought one spare set but what if I needed a new set each day? So I bought another set at the end of the stage so I would have one per day if necessary. Day one was also tough on the drive train. John Gerritsen (friend of Rick Plite’s) stopped with me and lubed my chain. I would lube it at the next checkpoints too with whatever they had. So when the stage ended I also bought a bottle of wet lube too, but subsequent stages were not as muddy or rough on the chain but it was handy to lube it periodically in the heat here. I finished safely in 10 hours. The finish line had cold pipe showers and dinner. The food was great all three evenings they supplied dinner! The showering aspect was a cluster for me as I dug through my bag to get what I needed. (I would organize my bag better for the finish of the next two stages). We were shuttled to the main hotel Best Western Irazu for the night. Up at 330am again, breakfast and back to room to get gear on and mix bottles. Friday’s stage had less climbing (8000 feet) and was shorter at 50 miles. The profile did not look as tough either (no spiking climbs) as it was a long up, followed by essentially long down. The “down” was the kicker! Jagged tough cow-track, full of rocks, ride the brakes. I checked my brake pads and they looked fine for another day so I didn’t change them. Stage two was more eventful with three crashes! Two were due to miscalculation on a downhill switchback when I let the front wheel bite softer than expected soil (since there was so much rock)! The wheel caught and turned and tossed me- each resulted in scrapes to each elbow respectively. The third crash was just stupid. Flat section, rutted two track and I let the wheel slide onto the berm and down which sent the bike on its right side and me rolling off through a barb wire fence! Luckily the lower of three strands was broken off. I rolled under the middle strand and down the embankment three feet, ending up on the broken third strand. One puncture wound and scrapes but nothing serious. My elbows were actually bleeding worse. My bib-shorts, however, had a a big tear out of the buttock area showing a bit of Murphy hip/posterior. Quite a dumb mistake considering I’d just done a great climb on some rocky terrain passing several riders and making it up about 2/3rds of the way as most other riders walked the climb. Anyway, I had just passed a few people on a climb and one of the English riders came along as I clawed my way up the embankment under the wire back to my bike. But I finished the rest of the stage without event. The stage also featured the highest altitude- and coldest temperatures as we rode from one volcano to the other. At the next-to-last checkpoint I put on arm warmers and wind-vest which turned out completely adequate. I peeled off the arm warmers at the last checkpoint but left the vest on mostly because I had lost one velcro strap I had used to attach it to the handlebars, but also due to the crashes a Hammergel pack had busted and everything in that pocket was gooey. It did get hot as I rode to lower elevation to the stage finish. Showering at the end of the stage was more efficiently due to better bag organization, then dinner and then to first aid to have wounds cleaned and sanitized. (Tetanus needed next week). Then we were off to lodging. Lodging Friday was an experience with shuttle buses dropping people off at all different locations. I can only assume Friday was more difficult to lodge everyone in one location. I was teamed up with Herman Quirynen from Belgium. We had a bite of dinner at the Guayaba Lodge then hit the sack for morning wake-up. One a side note regarding crashes, I saw a few people bandaged as I was, minor scrapes. But one guy finishing about 7 hours hot-dogged through the finish crashed and broke his collarbone! Doofus! A more serious crash occurred Saturday. As we were climbing on long grade the ambulance went by. On a descent filled with hairpin turns, on one turn the medics were lowering a body board over a 3 foot wall. Someone apparently didn’t make the turn and went over the wall a few feet to the rocks below. There wasn’t even a bike in sight! A race official later told me that the Mexica rider had punctured lung and several broken ribs. I thought I set my alarm but did not. Luckily Herman had his alarm set for 341am so we got up and dressed and headed to breakfast. The shuttle was due at 530am with q bit of a drive to the start line for 7am start (instead of 6am as was for days 1 & 2). We boarded the shuttle … And sat there! The driver was BS-ing. So another racer got out and prodded him to get rolling so we would not be late. The race start was the same location as day two finish. I got my bike, checked the brake pads again (okay for another day) and checked my bag to the transport truck. Off to the start line. Stage three had huge climb and steep climbs right away for 25-30 miles then downhill for miles until close to sea level. After that the course went through little villages and traversed numerous train trestles where you had to carry the bike and step from board to board. There was also a couple river crossings which I waded through carrying the bike. (I do not think I rode through any river crossing the entire race. Most were too deep or flowed too fast). We also rode down long sections of railroad right down the middle of the tracks. Mostly this was full of gravel, but not always which made for a bumpy ride on some segments. And it was HOT. I already had a slight sunburn from day 2 at altitude in the sun. Now miles upon miles were in the open. This stage apparently also goes through some riskier areas of Costa Rica. We heard warnings that as riders zoom through small villages, locals would point direction and lead riders off course, bonk them on the head and steal the bike. It was suggested to ride in groups through this section. I ended up riding much of this solo, however, as there no riders near me at the time, so I diligently watched course arrows and had no problems. One of the English riders had three Costa Rican riders insist he ride with them. He had a flat tire in this area and they stopped and came back and stood around him as he fixed the tube. It was definitely a different aspect of Costa Rica with quite a lot less interest in the environment or keeping trash off the ground. My roommate Herman caught up with me about 30 kilometers from the finish. We rode together the rest of the stage. (He had done La Ruta before). At one point we gathered up four other racers and hammered a pace-line at 16-17 mph for several miles. I think I pulled the paceline for more than two miles, signaling and weaving from the left side to the right side as needed to ride the smoothest part. We also rolled by another small group of racers in their own pace-line. We kept this up until a train track section disrupted the line. There was also a couple more trestle crossings. At the last, as we went up the embankment to cross, little kids were there saying “Chocolate? Chocolate?” I pulled out my last two chocolate Hammergels and Cliffbar and gave them to the kids. Herman got a photo. I told the policeman sitting there “that will keep them up all night” to which he responded sourly “thanks” .. I suspect they were his kids hahahahaha! I reached the last checkpoint with about 7-8 miles to go. We refilled bottles as volunteers doused us with buckets of water to alleviate the heat. (In all stages when hot, locals would be out by the road with bottles or even hoses and douse you as you rode by. Little kids would line the roads with their hands out for a high five). The Caribbean was visible a couple hundred yards away. … then past the commercial port with container ships. On a last small climb I downshifted and dropped my chain and had to stop. I rode hard and caught up with Herman (he had slowed a bit after realizing I wasn’t right behind him) and we rode into the finish shoot one behind the other across the sand past the timing sensors- I had completed The Route of the Conquistadors mountain bike race! Flight back to Miami on Monday- checked the bike but they only checked it to Miami rather than all way through to Grand Rapids. This was the first time doing international travel where I had to go OUTSIDE security.. in the past, I’d go through customs and take checked bags to my airline’s inside receiving to re-check it for the remaining segments of the trip home. Not in Miami- I was back outside security and at the normal ticket gate- where she gave me boarding passes to Chicago and GR- but would NOT take my bike box. uh? She said it was too early (5pm Monday) and my flight wasn’t until 730am Tuesday. I could either check it after 9pm or bring it in the morning before my flight. I had considered hanging out in the Admiral’s Club, then sleeping in the terminal for 4 hours yesterday… but since I had to lug the bike around.. I opted for a hotel stay last night, instead, and checked the bike this morning. Whew- off to get a tetanus shot and unpack from my very big adventure. All in all, a great time- VERY tough riding. I would do it again in 3-4 years, probably not much sooner due to the cost. The race is $1350-1600 alone depending on how early you register. If you pay for bike maintenance after each stage (well worth it however), there’s $180. You also need to pay for lodging on Wednesday or any day before that- as well as lodging for Saturday night and later. And, of course, the flight. There were many riders, including some USA riders, who had friends or family as support on the course. I would gladly go back sooner as support for teammates or friends and drive the vehicle to locations ahead of riders so as to provide food, beverages and maintenance support on the course. I reached the last checkpoint with about 7-8 miles to go. We refilled bottles as volunteers doused us with buckets of water to alleviate the heat. (In all stages when hot, locals would be out by the road with bottles or even hoses and douse you as you rode by. Little kids would line the roads with their hands out for a high five). The Caribbean was visible a couple hundred yards away. We rode along the beach then past the commercial port with container ships. On a last small climb I downshifted and dropped my chain and had to stop. I rode hard and caught up with Herman (he had slowed a bit after realizing I wasn’t right behind him) and we rode into the finish shoot one behind the other across the sand past the timing sensors- I had completed The Route of the Conquistadors mountain bike race!